When I first spied Cid’s Ma Mon Luk hiding in a tiny storefront next door to the now empty and boarded-up Golf Glen Theater, on a recent trip to the nearby SunView market in Niles, I thought the name looked familiar. A quick search of LTH-Forum indeed rendered a brief mention of another similarly named restaurant on Southport and Irving Park(which is now closed?). At first I thought the two venues must be somehow related, but a little more research revealed that Ma Mon Luk is a commonly used name for Filipino restaurants (although the name is Chinese). For decades, there was a very popular Cantonese restaurant in Manila by that name, which grew into a small chain. At one point in the 1990s, there were five Ma Mon Luk restaurants operating in Manila. Currently there are only two. Both are still owned by descendents of the original founder, the venerable Ma Mon Luk. There is another small chain of similar restaurants, called Masuki, which are owned by Mr. Ma's grandnieces. Both Cid's and the closed restaurant on Southport, as well as another in California, all of which use the Ma Mon Luk name, are totally unrelated to the original in the Philipines. I am not sure the imitators are really trying to co-opt the brand name of the original venture as much as they are paying homage to the Algeresque legend of its founding proprietor with the same name. From what I could find online, Ma Mon Luk was a young Chinese schoolteacher who lived in Guangdong in the early 20th century. He fell in love with a rich businessman’s daughter. When he asked for the girl’s hand in marriage, the girl’s father told Ma that, being a lowly schoolteacher, he was too poor to marry. So Ma swore that he would go out and make his mark, then return to Guangdong as a successful businessman to claim his bride. In 1918, Ma spent the last of his money to travel to the Philippines to seek his fortune. Shortly after arriving in Manila, he scrounged together enough money to start peddling Cantonese style egg noodles on the streets of the city. He would carry a bamboo pole across his shoulders with a bucket on either end. One of the buckets held hot coals and a container of hot broth, while the other held strips of dried chicken and sheets of Ma’s special noodles. Although there already were many noodle sellers in Manila, Ma was the first to offer this Guangdong specialty. Around his waist, Ma wore a pair of scissors on a rope. When a customer bought noodles, they would order them by length. Ma would then cut the noodles to the desired length with his scissors and drop them in the boiling broth with strips of chicken to cook for a minute before dishing them into a bowl. Ma Mon Luk would walk all over Manila hawking his soup. After a short while, he developed a solid following, especially among the students of Manila who were always looking for cheap eats. Ma’s devoted customers dubbed his noodle soup “mami”. Some sources claim the name originated as a combination of the Tagalog words for chicken and noodle. Others say it simply means Ma’s noodles (I think this is more likely). Eventually, a customer of Ma’s offered him the use of a kitchen and a small space in which to set up some tables. Now that he had a kitchen at his disposal, Ma introduced another delicious Cantonese specialty, the Siu Bao, or steamed pork bun. The Siu Bao were served with Ma’s “secret” sauce that made them even more appealing. Ma Mon Luk’s restaurant quickly started growing in reputation and size. Nevertheless, the now prospering Mr.Ma continued walking about town with his buckets on a pole, giving away samples of his noodle soup as a promotion for his restaurant. Soon, people came from all over Manila to taste the house specialties of Mami and Siopao. Eventually, Ma Mon Luk became one of the most celebrated restaurateurs in the Philippines, and his invention, Mami became a popular national dish. He died of throat cancer in 1961 at age 63. Oh yeah, and he did go back to Guangdong to marry the girl. So, armed with this bit of culinary folklore, I ventured into Cid’s Ma Mon Luk to sample their interpretation of Mamonluk's noodle soup and pork buns ( which were advertised prominently in neon in the window). To say Cid’s is tiny is being generous, but I guess that is consistent with the humble beginnings of its more famous namesake. 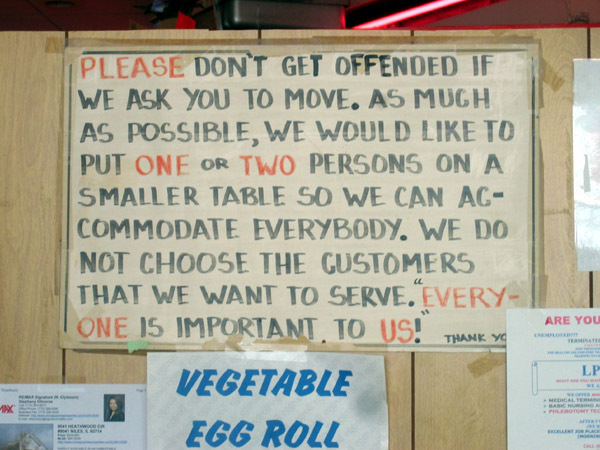 There are only 7-8 small tables crammed into the front half of the storefront, with the kitchen in the back. When I got there at 3:30 in the afternoon, about half the tables were occupied. When I first saw Cids menu ( http://jacksongray.com/mal/menu.jpg ) and the food on the adjacent tables, I realized there was much more to the little place than just noodles and buns. I was almost tempted to deviate from my plan, but in the end I ordered what I had originally intended, soup and a Siopao. I also ordered a glass of calamansi juice. The Mami comes in a variety of configurations with different meat options and a couple of noodle options. I got the impression one could pretty much order the soup any way they want. I ordered the “house” Mami which contained a little of everything (wontons, duck, pork lechon, fish balls, shrimp and beef). Because this version contained wontons, the noodles used were of a thinner variety. 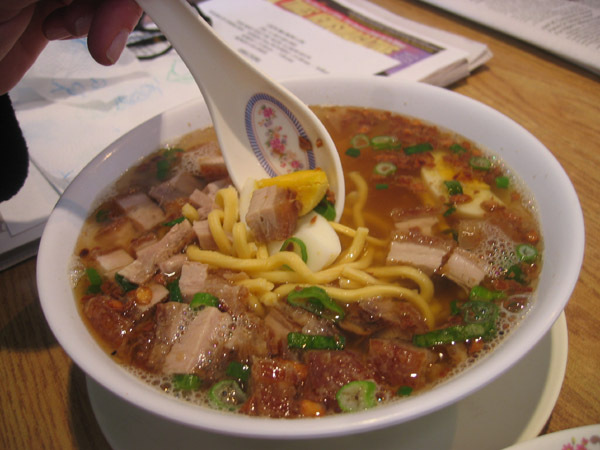 I think “Cid’s Mami”, which is made with Lechon, Roast Garlic and egg, uses a slightly thicker noodle. Anyhow, the soup was quite tasty, and certainly hit the spot on a cold winter day. The duck and pork were the predominate flavors, the pork imparted a smoky flavor to the rich broth, and the roast duck gave it a touch of the comforting aromatic oiliness that only rendered duck fat can provide. The fish balls, on the other hand, were rather bland, but provided a nice texture. 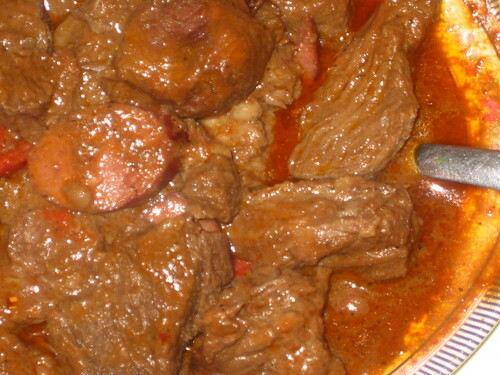 The beef was tender and stewed in a slightly sour marinade. The wontons were stuffed with a garlicky seasoned ground meat filling. Despite the “everything but the kitchen sink” configuration of the dish, it was actually made with a deft hand, very well balanced. The noodles were of the thinner variety much like an angel hair pasta or skinny vermicelli. 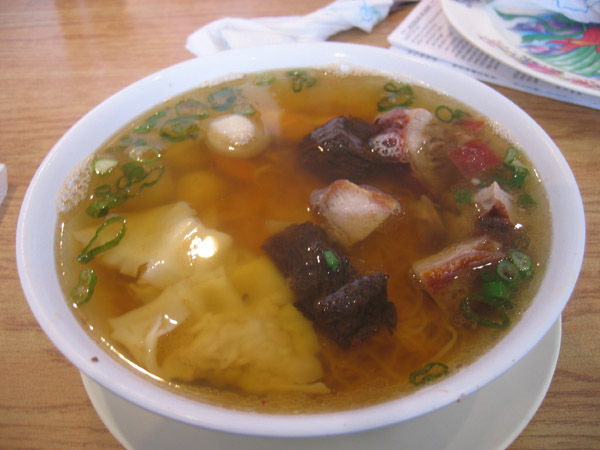 The next time, I will order Mami without wontons, which should come with slightly thicker noodles. As to Ma Mon Luk’s other signature specialty, Cid offers 5 types of Siopao. The regular Siopao is filled with shredded pork, chicken and egg. I ordered the “special” Siopao, which also contained that sweet dried Chinese sausage. The Siopao was the size and shape of a small grapefruit, and came wrapped in plastic wrap. I thought it was a little weird that they didn’t remove the wrap before serving, but actually it kept the bun nice and moist until I was ready to eat it. The Siopao's steamed dough was somewhat gum-like but still moist and light inside. It was was packed full of shredded a meat filling that was slightly sweet, tender and flavorful. The bits of dried sausage made a nice addition. The accompanying sauce was fruity but not overly syrupy. All in all, it was a very nice rendition of a steamed pork bun. The next time I will try the adobo filling. The Calamansi juice was wonderful. The flavor was sort of a cross between lemon, lime, and tangerine. It was fresh squeezed and sweetened just enough to not overwhelm the tangy citrus flavor. It was very refreshing, and a perfect accompaniment to the hot soup. So, in summary, it is very difficult to judge a restaurant with a single solo experience, but what I had at Cid’s, I enjoyed. I also liked the look of the dishes I saw served to other customers (the place is so small it is difficult not to pay attention to what others are eating). I am not very familiar with Filipino cuisine, so I don’t really have a standard by which to gauge the quality of the food at Cid’s. However, I overheard the discussion of two young Filipino-American women at the next table as they carefully analyzed each dish they sampled. They seemed very impressed with Cid’s interpretation of certain dishes, others, not so much. I would be very interested in what others, who are more familiar with the cuisine than myself have to say about the place. I will definitely be going back to try some of the other menu items (not to mention the $4.95 lunch specials). The lechon kawali in my soup was very tasty. I would like to return to try a whole order of that. By the way, the Golf-Glen shopping center is an amazing little place to explore, despite the derelict condition of the anchor theater complex. Aside from Ma Mon Luk, there is Sun View market (which has an amazing selection of breads and feta cheese), a Korean BBQ, a Korean karaoke bar with food, a Chinese restaurant, the Filipianna Restaurant, a small but interesting Filipino grocery, two small Indo-Pak groceries (and video store), a newly opened Sushi place, a Ginseng store, a Russian gift store and the venerable Omega Greek-American coffee-shop. We could probably do a whole Golf-Glen-a-thon. Last edited by d4v3 on May 16th, 2007, 6:55 am, edited 6 times in total. Sorry, I apologize if anybody has had trouble reading this thread, but my ISP is having "network issues" (again). I have temporarily moved the images to another server, so barring any other "network issues" they should now show up, without sending your browser out to lunch for an hour. Unfortunately, all my other pictures in my other posts will still be unavailable. Again, I apologize if this thread caused your browser to timeout downloading the images. With or without pictures, I am going there for lunch today. Closed Mondays. Filipianna might have gotten their second chance, but they were closed as well. Visited the Filipino grocery story next to Filipianna where I purchased Calamansi juice (only 8%) concentrate. It tasted just as you described. Cathy2 wrote: Closed Mondays. Filipianna might have gotten their second chance, but they were closed as well. Sorry, Cathy2. The owner told me they were closed on Mondays, but I totally forgot. I was looking forward to reading your opinion of Cid's. I think the Calamansi-ade I had at Cid's was fresh squeezed, there was pulp in it (although it may have been frozen). I usually do not care for thick egg noodles. Most of the time there is a faint baking-soda-y taste that I cannot stand. Not these noodles... Soft and springy... The lechon pieces were plentiful and still crunchy despite being in the soup. I ordered a special siopao to go, and was happy I did so at the beginning of the meal, because I got the last one! The siopao was wrapped in plastic and cold. But 2 minutes in the microwave heated it right up. I especially liked the pieces of hard-boiled egg in the pao which caught me by surprise. Anyways, thanks d4v3 for finding this place! Dave, thanks for posting. I especially enjoyed the fact that you included the history. I hope to eat there next week with C2 and helen. d4v3 wrote: The Calamansi juice was wonderful. Thanks for the heads up on Cid's, a very nice little spot. In particular I enjoyed the Calamansi juice, tart, refreshing and not over sweetened. I've had something similar, though not as complex, at Hoanh Long in the form of fresh lemon juice with soda. I had a Regular Siopao (pork and chicken asado w/egg) which was nicely complimented by a small dish of hosin and the house chili paste. Next time I will order the special which, as you mention, also contains Chinese sausage. I had Cid's Mami, enjoyed the slightly thicker noodles, lechon, hard boiled egg and fried garlic, though I found the broth salty. I should note my salt tolerance is slightly lower than most. I had the pleasure of Steve Z's company at lunch, he had the House Special Soup (Mami), which he can comment upon. As you mention there are a number of lunch specials, all under $5* which bear exploring. Thanks again Dave, it's unlikely I'd have found Cid's without your post. G Wiv wrote: I had the pleasure of Steve Z's company at lunch, he had the House Special Soup (Mami), which he can comment upon. I'm glad I went and really enjoyed the calamansi juice, which I thought had a cross between lemon and grape tastes and, as has been pointed out, wasn't overly sweet. It was very refreshing. I wasn't all that enamored with the rest of my meal. I guess I prefer soups and buns from Japan, China and Vietnam. I'll just leave it at that. stevez wrote: I guess I prefer soups and buns from Japan, China and Vietnam. I'll just leave it at that. I also found myself comparing the mami to pho and udon soups, and thinking I liked them better. I was hoping that the 'house' mami, being the house specialty, would blow me away, but it was just alright, very good on a very cold day but not great (Although, I did think the bun was pretty good). Truthfully though, I am not really a big fan of noodle soups at all (especially the skinny noodles). Also, I could have done without the Won Tons. I think when it comes to Mami, the original simple recipe is probably better (with the thicker style noodles). I am eager to try some of the many other traditional filipino dishes at Cid's. What I saw on other tables looked and smelled pretty darn good. When I was there, it seemed that the other patrons were not having the mami, but concentrating on the other offerings. Since I often shop in the area, I will continue to work my way through Cid's menu when I am out that way. It is the kind of place I want to find a reason to really like. Josephine, Helen and I lunched at Cid's on Tuesday. We were not able to order any siopao, which we were prepared to order one of each for chow science, of course. We learned these are made in-house Wednesday-Friday with enough made for the weekend. However by Tuesday they are usually out of siopao. I ordered the calamansi juice, which tasted pretty much like the frozen concentrate I had bought the week before at the Filipino store next to Filipianna. My friend Helen initially order calamansi juice, but quickly changed it when she saw they offered Sago & Gulaman. 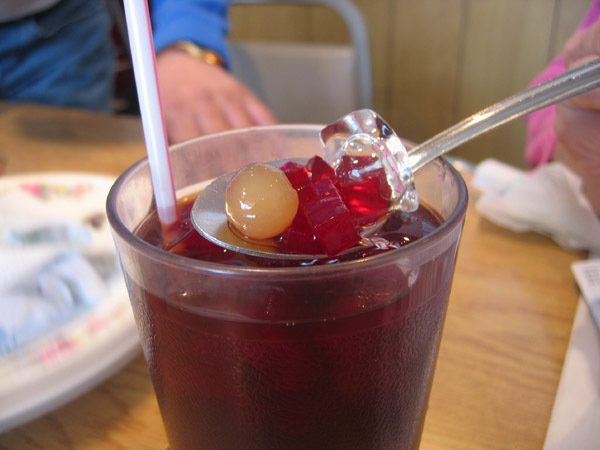 Sago is tapioca balls and gulaman is gelatin cubes, which are mixed into this drink. Helen had had similar in Manila recently and didn't particularly like Cid's interpretation, though it sure is pretty. Helen and I had the House Special Mami with home made stuff won tons, head-on shrimp, some roast duck and pork. What I especially liked was the dark pieces of beef stew, which were chewy bits of meat seemingly cooked in 5-spice powder. I could easily skip all the other meats and just concentrate on the beef stew, it was a nice taste and texture. Josephine ordered Cid's Mami, which are egg noodles with fried garlic, boiled egg and lechon kawali. She allowed me a sample of the noodles, which were terrifically toothsome. Over on the next table were some regulars who were enjoying our discovery revery. One them got sizzling pusit (squid), which was served sizzling on an iron plate. If we didn't have a table filled with food, this would have been a very tempting addition to our order. We'll be back to check other items on the menu. Thanks d4v3 for taking up Josephine's suggestion to post on this place. As Gary said, it would have been very easy to overlook it. We went last week to try the soup. I ordered the shrimp wonton noodles and my mom ordered the House Special mami along with the special siopao. There were more inedible shrimp heads in my soup than shrimp meat. The wontons were pork filled but nowhere as tasty as their Chinese counterparts. The lechon and duck were okay in the House Special and the beef stew is different but okay as well. The fish balls were stale which was not a good sign. The siopao is different from the char siu bao in that they mainly used shredded pork. It had very small slices (maybe 2) of Chinese sausage. It was probably the highlight of the meal. The lemonade was a disappointment. I wouldn't go back for the wonton soup since places like Wonton Gourmet in nearby Des Plaines are much better. 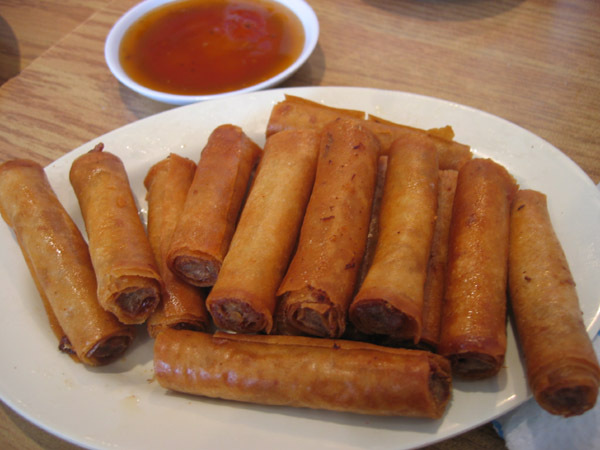 But I may try the lumpia and one of the non-fish/non-soup dishes next time. I'm Filipino, and used to frequent this place a lot. I'm not sure if they still have it, but the one thing I always ordered is something called Bicol Express. It's basically an intensely flavored stew meant to be eaten with rice. They serve it with shrimp and mussels but I've had other versions with pork. It's comparable to a Thai curry since coconut milk is the main ingredient but instead of curry, I believe they use bagoong (fermented shrimp paste). It's usually made really spicy and the heat level is comparable to Thai curries as well. I can't really tell you why the dish goes by that name. All I know is Bicol is a city in Northern Philippines. Bicol Express is on the menu for $13.50. The ingredients listed are beef, squid, mussels on 1/2 shells, green pepper and coconut milk. Sinigang na baka is a beef tamarind soup. It's nice and sour. Sinigang is usually served with seafood or pork, but I'm finding that beef is becoming common these days as well. Tokwat baboy is a pork side dish (?) that is cooked with vinegar and soy sauce, almost an adobo treatment. I believe tokwa is the same as tofu. So it is bean curd with pork (fried, I would guess). Cathy2 wrote: Bicol Express is on the menu for $13.50. The ingredients listed are beef, squid, mussels on 1/2 shells, green pepper and coconut milk. Had the Bicol Express the other night -- pardon the disrupted dish, I was dining with a non-LTHer who dug in, not realizing you have to wait before I take pictures (kind of like saying grace) before eating. Anyway, this was a very good bowl, but in an odd way. 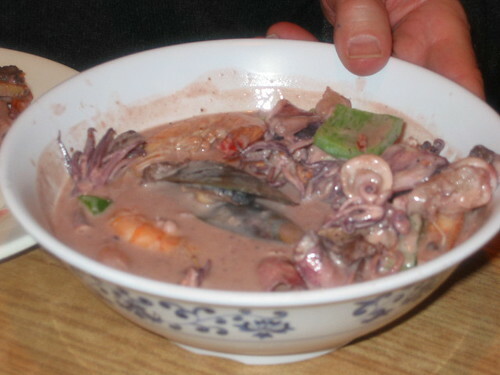 There were many unidentified sea creatures -- dark-colored squidy things that I did not recognize, scraps of tentacle, toothsome blobs of soft marine meat -- in a coconut broth, a touch of spice, really very good. The Wife wanted to order the dish because it had a funny name (she's easily amused: the secret of our marriage), and it was not nearly my cup of meat: chunks of lumpy fat in what may have been a blood-based broth (our server first said it was, then said it wasn't; it tasted like it might have been). My far-and-away favorite was the roast pork. I ate a lot and could have eaten vast quantities more. So crunchy, rich, flavorful. David Hammond wrote: Had the Bicol Express the other night -- pardon the disrupted dish, I was dining with a non-LTHer who dug in, not realizing you have to wait before I take pictures (kind of like saying grace) before eating. Anyway, this was a very good bowl, but in an odd way. Bicol Express does not look appetizing in the least though, as you said in this thread, "pix lie." 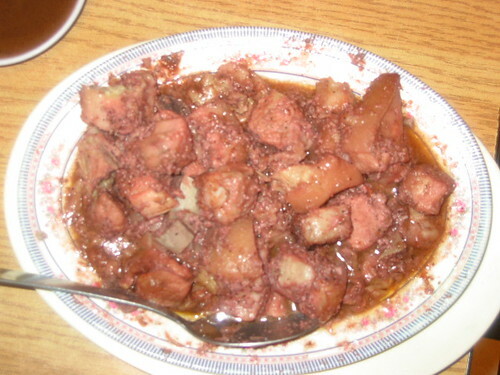 Frankly, the binagoongangbaboy doesn't look all that tasty either. I plan on going back to Cid's for roast pork, probably, on the strength of your recommendation, will order Bicol Express, but I'll keep my sunglasses on. Last edited by G Wiv on March 27th, 2007, 7:18 am, edited 1 time in total. G Wiv wrote: Bicol Express does not look appetizing in the least though, as you said in this thread, "pix lie." Part of the lack of attractiveness in this shot is attributable to the disruption of the dish by my overzealous dining partner, the inept lack of focus, the careless angle, etc. All that said, it' be tough defend, on aesthetic grounds, the appearance of many hacked up cephalopod bits and pieces, along with a few shrimps, in a milky pink broth...still, I liked the taste and had seconds and, I think, even thirds. I was tempted to order the dish for the very same reason. I love saying the name of it (it sounds like someone playing drums). Now that I have seen a picture, not so much. It seems many of the pork dishes are made with pork belly. I would not recommend it. I doggy-bagged most of the dish, but now find myself afraid to look in the carton. I will not be eating any more of it. We tried out this place not long after d4v3's initial post. Jimthebeerguy and our kids loved everything we ordered, but for some reason I was Ms. Picky. I didn't like either of the two Mamis, nor did I like the calamansi (it tasted like it had been unrefrigerated for a couple of days). But dear God, did I ever love the Pansit Guisado! It looked like a typical meat and noodle dish, but it tasted like heaven. I practically licked the plate clean! We *will* be back, and I'm hoping there will be fresher calamnsi next time. I thought the noodles in the Cid's Mami were great, and liked the garlic flavor as well. 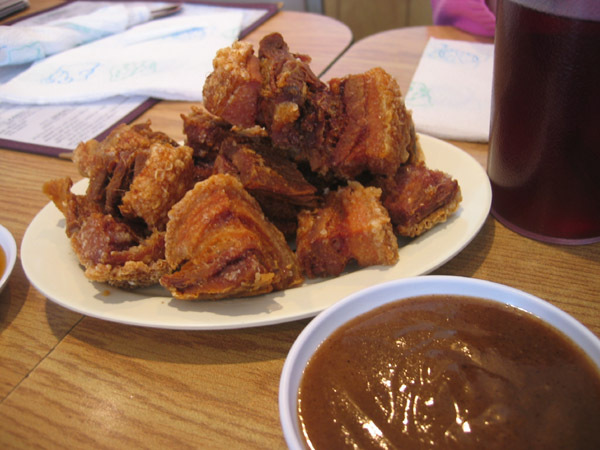 I gotta say though, that "boiled fatty pork that has been fried and served with liver sauce...outstanding chunks of double-cooked bacon" and the accompanying picture sound and look too good to pass up next time! Also the dumpling we got was good. We got the one that had some lop chong in it as well as other meats, and I'm a big fan of lop chong. Meant to post this before. A favorite with my non-LTHer friend, Mr. Grumpypants, was this caldereta, which he declared, "Just like my mother's pot roast." This is a homey preparation, in no way startling or sensational, but just very tender, full-flavored beef in a relatively mild sauce. The sausage provided more visual interest than taste, but overall this was a pleasant dish, if not quite enough to motivate another drive to Niles. Ma Mon Luk Restaurant in Manila is still owned by the descendants of the original Ma Mon Luk family, there are only 2 existing in Metro Manila, one in Quezon Avenue near Banawe St. Quezon City, the other one is in Quezon Boulevard near Quiapo Church(still in its original 1940's site) Manila. Ma Su Ki is owned by the grandnieces of old man Ma Mon Luk, the founder of the restaurant chain in Manila. It is a totally different entity from the Ma Mon Luk Restaurant chain but has the same recipe. Last edited by punchmml on May 15th, 2007, 11:05 pm, edited 1 time in total. Where is Ma Su Ki located? Are there any approved Ma Mon Luk in the United States? Ma Su Ki has 2 branches: 1 in Benavidez St. in Chinatown and the other is along Ortigas Avenue in Greenhills, San Juan(sorry forgot the name of the Building, its on the 2nd floor). Both in Metro Manila Philippines. punchmml wrote: Ma Mon Luk Restaurant in Manila is still owned by the descendants of the original Ma Mon Luk family, there are only 2 existing in Metro Manila, one in Quezon Avenue near Banawe St. Quezon City, the other one is in Quezon Boulevard near Quiapo Church(still in its original 1940's site) Manila. Ma Su Ki is owned by the grandnieces of old man Ma Mon Luk, the founder of the restaurant chain in Manila. It is a totally different entity from the Ma Mon Luk Restaurant chain but has the same recipe. Thank you for taking the time to post. I tried to make it clear in my original post that the restaurant in Niles was an imitator and related to the original in name only. There was another restaurant by that name in Chicago (now closed) also completely unrelated. That is what motivated me to research the origin of the name. I will edit my post to make it more clear that this restaurant has nothing to do with the original, so any future readers will not be mislead. I will also make note that the remaining Mamonluks in Manila are still owned by members of the original family (I read on another site that they were not). More than that, I hope I got the story of your relative's remarkable life, at least close to accurate. I included the story in my post because some members here thought it was interesting enough to share with the whole forum. Please understand, it was not my intention to lend creedence to the restaurant's use of your family name. If you have any more details of the Ma Mon Luk story that you would like to share, I am sure we would be eager to read them. I hope to someday taste the real Mami and Siopao recipes.